Although the name should be an indication, not many people realise that food at Hotel du Vin in Birmingham includes a full sommelier service. Getting first class suggestions on pairing wines to your meal may be something more associated with Birmingham's Michelin starred restaurants, but proud Hotel Manager Barry Sherwin boasts that you don't have to spend the earth on a meal to get this speciality wine service thrown in. "You could have a croque monsieur or a French onion soup to get recommendations on the perfect glass of wine to go with it", Barry tells me before showing off the daily wine table and extensive choices on the menu. "You know, Sauvignon Blanc is the most popular choice of wine in Birmingham. This city is the Sauv Blanc capital of the country, but we have that and much more to try here." Molly Aston is the sommelier at hand during my visit. She's enthusiastic and knowledgeable, providing me with a range of smooth and rich wines (including a Sauvignon Blanc) to accompany the various courses for myself and my friend. More on that as we go along. There's an enchanting, warm and stylish feel to the Hotel du Vin dining room in the stately Victorian building built in 1884. It's very central, close to both Snow Hill Station and Colmore Row. There's a wonderful lavishness about the hotel as soon as you step into the tiled floored atrium. The bar, full of old world charm, is off to the left while the Bistro is to the right. The emphasis is on good hearty French food. The menu is like a trip across France with a plentiful list of traditional dishes from various regions. It's all about genuine French classics making a comeback, from the Moules Marinieres to Bouillabaisse. Some of it is modern versions of "wholesome peasant food", Barry explains. 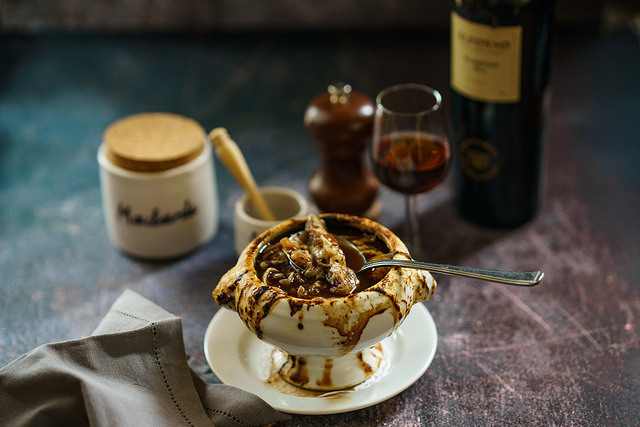 There's a flavoursome cassoulet with a duck leg seductively hanging out or an onion soup with bubbling melted cheese draped elaborately across the top of the bowl. It's clear as we go along, that all the portions are large but also rich in taste. 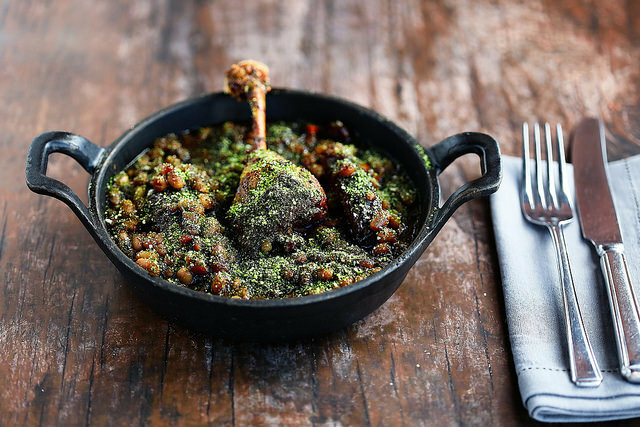 It's also good to see that the extensive choices come at affordable prices that cater for everyone from those popping in for a quick lunch or pre-theatre supper to diners who want to languish over a three-course dinner for a special occasion. The latest menu has added more light bites, priced from £6.95, along with more two or three-course fixed price menus from £17.95. There's baguettes, salads and croque monsieur/madame but also cassoulets, steaks or even the chateaubriand for two at £68. There's also an artisan cheese trolley. Talking of the fromage, Hotel du Vin are currently doing a "Blue Monday Cheese" by rock-star Alex James, which features a selection of eight artisanal cheeses. There's nine starters to choose from that cater well for vegetarians with a Saint-Maure goats cheese quiche, Sauteed mushrooms on brioche toast and onion soup. Meanwhile, there's snails, mussels, steak tartare, chicken liver parfait, smoked salmon or a sharer of charcuterie terrines and cured meats at £12.95. I opted for the quiche that was a pretty tartlet shape and delighted me with a lovely crumbly pastry holding warm melting cheese within. Molly paired this with the Chateau Bauduc Blanc, Sauvignon Blanc, which gave a fresh, zesty accompaniment to the goats cheese. My friend plumped for the classic of Soupe a l'oignon, which was particularly filling. Molly chose a Chateau De Belleverne, Chenas, Beaujolais, with the soup and the red was a good choice for the earthiness and heaviness of the onion flavours. 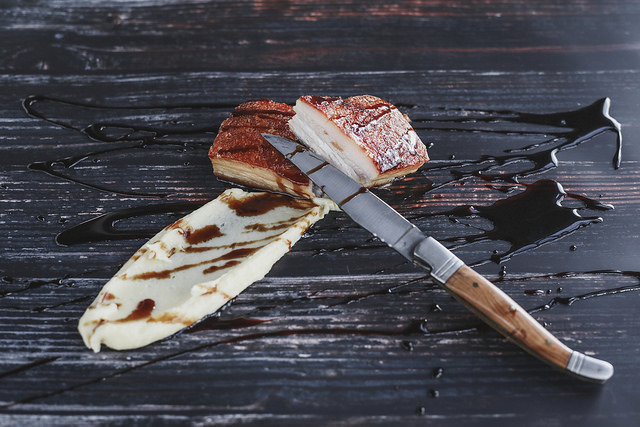 Moving on to the main course, I ignored tempting offerings like half roast Normandy chicken, the escalope of rose veal holstein and steak with a pepper sauce and frites, to opt for the Gloucester old spot pork belly instead. This had been slowly roasted overnight so the meat was tender but there was still a crackle to its edge. It came with a soft, exquisite pomme mousseline and jus, which added a creamy texture with the meat and was simply delicious. Molly paired this with a Hubert et Fils, Cote Du Rhone. The medium bodied, slightly spicy red goes particularly well with braised meats. My friend wanted something lighter after the onion soup and chose the roast cod with lentils du puy, which was still a good-sized serving. That was matched with a Conde Villar, Alvarinho, and this light white Portuguese wine proved a good choice to complement the flavoursome fish without drowning it out. The main course principal dishes are priced between £16 and £20 on the whole, but there are also a good selection of steaks, between £16.95 to £31.95, and plats rapides of favourites like mussels in a white wine, cream, shallot and garlic sauce with frites at £14.95 and grilled Normandy chicken escalope with frites and a house salad at £12.50. Other evening options range from a burger in a brioche bun with frites (£15.95) to vegetarian and salad dishes including an aubergine and halloumi parmigiana bake (£10,50), pumpkin and roasted chestnut risotto (£12.50) or Roquefort, pear and walnut salad (£9.50). Saving the best for last - as the French are masters of the dessert - this was always going to be the hardest choice of the meal. French favourites like apple tarte tatin, creme brulee and profiteroles are all there, but I was tempted by the Iles Flottante. A beautiful work of art turned up with the Ile Flottante decorated in rosy pink chopped pralines at £6.95. 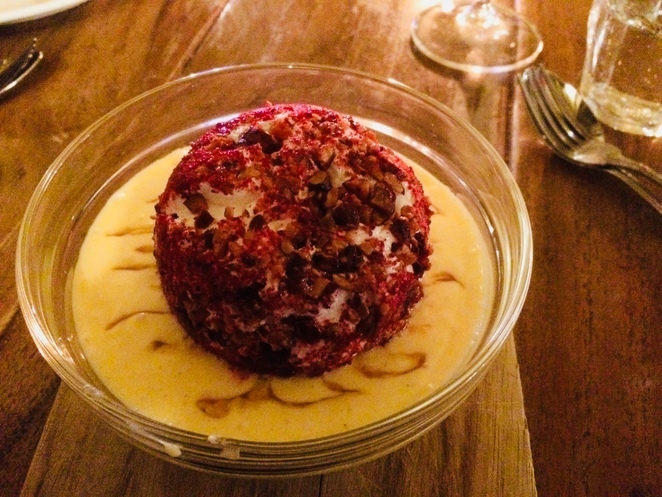 The dessert translates into "floating island" as it is a ball of meringue floating amid creme anglaise. It also had a caramel sauce and is something for the most sweet-toothed among us. My friend went for the apple tarte tatin, which was gloriously sticky and sweet and accompanied by creme Normande. Once again, the portions were extremely generous. 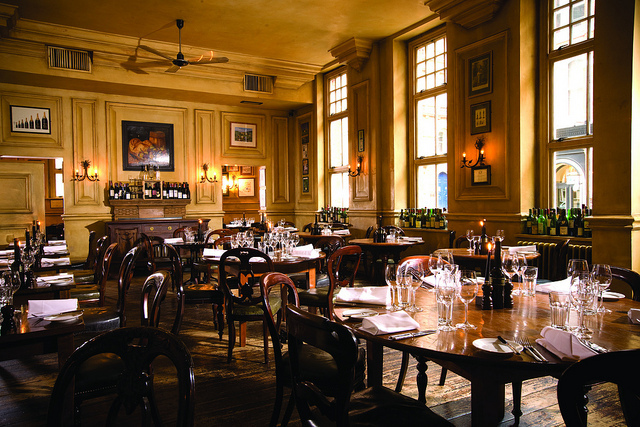 Hotel du Vin is going back to its French roots with a menu that savours the best of the country's local favourites from food to wine. So, whether it's a Croque or a cassoulet, everyone can make a toast to 'bon appetit, vive la France'.